I have been seeing Instant Pots all over the WORLD. Well, basically all over Pinterest. They are all the rage! Basically, an Instant Pot is a brand name for a pressure cooker. Like how people call tissues "Kleenex", even if they aren't Kleenex brand. Right. So I was pretty stoked when Cosori contacted me to try out their pressure cooker. I was NOT disappointed. Their pressure cooker is super duper user friendly and a breeze to use. It came with a recipe book and a very helpful manual that was surprisingly clear and concise. Plusss, at the $70 price point, you just can't go wrong! You can check out the link to the exact model I used here. I tried out a few basic recipes to get started, but the first "real" dish I made was this Mongolian Beef recipe (adapted from here). This was very quick to whip up and didn't require a lot of crazy ingredients. (Score!) It was sooo tasty and the meat was very tender. The meal is both picky husband and toddler approved, so I will definitely be keeping this on the dinner rotation! Oh--- and did I mention that this recipe is low carb friendly?! You can sub out the brown rice we used for cauliflower rice, and you can also use frozen veggies that are lower in carbs (like broccoli and green beans only). It does call for some cornstarch, but for the amount of cornstarch it used per serving, I'd say it was worth the carb or two! 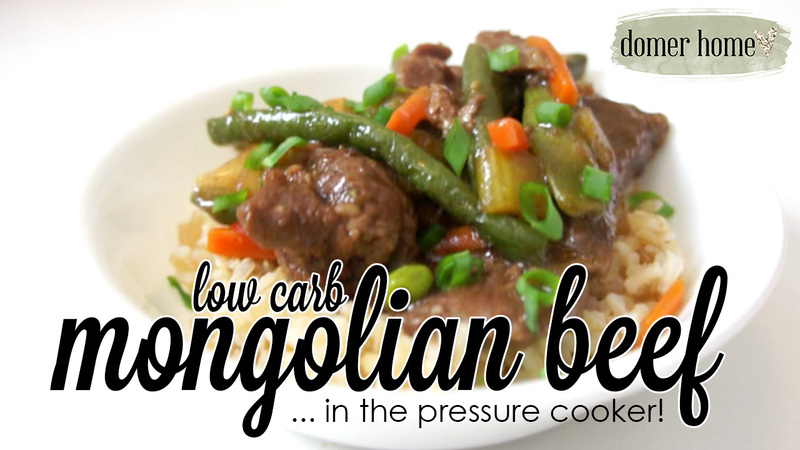 Make sure y'all check out the printable recipe below and the video to see how simple the pressure cooker and recipe are! Heat the oil using the saute mode. Saute the garlic for a minute before adding the beef. Cook until mostly browned, stirring frequently. Add the broth, soy sauce, and splenda, and stir until the sweetener is dissolved. Secure and seal the lid. Manually cook for 15 minutes at high pressure. While the meat is cooking, microwave or steam your veggies. When the pressure cooker is done, carefully vent the steam to release the pressure. Remove 1/4 c of the cooking liquid and stir in the cornstarch until it is dissolved. Add the cooking liquid mixture back with the meat and let simmer on the saute mode for a few minutes so the sauce can thicken. Stir in the heated veggies. Serve over rice or cauliflower rice and sprinkle with sliced scallions as a garnish! Thank you for sharing the recipe...it looks amazing.